We’d love your help. Let us know what’s wrong with this preview of The Real Michael Swann by Bryan Reardon. On a typical late summer day, Julia Swann is on the phone with her husband, Michael, when the call abruptly goes dead. Then the news rolls in: A bomb has gone off at Penn Station, where Michael was waiting for a train home. New In a new novel from New York Times bestselling author Bryan Reardon, a suburban family is rocked in the wake of a terrorist attack on American soil. To ask other readers questions about The Real Michael Swann, please sign up. So what are we to make of the epilogue? Answers will certainly contain spoilers! "I move, I thought. Therefore, I must live." This was one emotionally charged and powerful story, one that is well needed in this age of fear mongering and social media. The heavy handed digital footprint expounded upon in this story was so well done and it's one I'll be thinking about for quite some time. The premise of the novel depends on you, the reader, going in without any prior knowledge of the plot, so I'll just leave it at yes, you should read the book. That epilogue though... Can we dis "I move, I thought. Therefore, I must live." This was one emotionally charged and powerful story, one that is well needed in this age of fear mongering and social media. The heavy handed digital footprint expounded upon in this story was so well done and it's one I'll be thinking about for quite some time. The premise of the novel depends on you, the reader, going in without any prior knowledge of the plot, so I'll just leave it at yes, you should read the book. That epilogue though... Can we discuss please? One moment, Julia Swann is on the phone with her husband, Michael. He's calling from New York's Penn Station, where he's waiting to catch a train home after a job interview, but the trains are significantly delayed. Without warning, Julia hears a noise in the background and then Michael's call is dropped. She tries not to worry, but as the hours roll by, she still hasn't heard from Michael, nor can she reach him. That evening she finds out that a major incident occurred at Penn Station which left One moment, Julia Swann is on the phone with her husband, Michael. He's calling from New York's Penn Station, where he's waiting to catch a train home after a job interview, but the trains are significantly delayed. Without warning, Julia hears a noise in the background and then Michael's call is dropped. She tries not to worry, but as the hours roll by, she still hasn't heard from Michael, nor can she reach him. That evening she finds out that a major incident occurred at Penn Station which left countless people dead and injured. Julia needs to believe Michael is okay, so she decides to drive into New York City to try and find him herself. Even though the city is in the midst of massive chaos, she is determined to get answers as to where he is, and whether or not he was injured. She, like many others, puts up flyers all over the city, asking for people to get in touch with her if they see Michael. Julia is pleasantly surprised when a woman calls her and says she may have seen Michael. But that surprise quickly turns to uncertainty and fear. Why hasn't he called her or responded to her texts? Where is he heading? Unable to get answers from the authorities, who suddenly view Michael as something other than a victim, Julia knows she must find her husband and get him whatever help he needs, even if she's not sure what to expect anymore. Julia's efforts to find Michael are juxtaposed with her reminiscences about their relationship, from their meet-cute at a beach party just after college, to their falling in love and building a future together. She also remembers their struggles, as money problems, job struggles, and the responsibilities which come with raising children took their toll on their marriage. But Julia cannot envision a life without her husband. "In the end, it seems like the moments we thought we messed up were nothing. And we can't even remember the stuff we really screwed up." The Real Michael Swann is part thriller, part love story, as Julia desperately searches for her husband and for answers to the questions she is afraid to voice out loud. All of this is played out against a backdrop of national terror, political unrest, and a fractured society, all of which seem eerily too real in today's world. I enjoyed this book and found it grabbed me from the start, although at times it moved a little slower than I expected. There are some other plot points that I didn't want to mention for fear of spoiling them, so hopefully you don't read too many other detailed reviews which might give some of it away, but suffice it to say there is a third narrative which adds another fascinating dimension to this book. Let yourself get immersed in this story. Bryan Reardon is a terrific storyteller and he knows when to push the suspense and when to slow it down a little bit so things don't get too intense. Definitely one of those thrillers perfect for devouring on the beach, on a plane, or in a hammock somewhere. The storyline is unique and highly intriguing. Julia Swann is on the phone with her husband Michael when the call goes dead. A bomb has gone off at Penn Station in New York City 4.5 stars! I couldn’t put this book down! The tragedy is intense and heart breaking. The aftermath of chaos and confusion is palpable. The desperate search for answers is a heart pounding and jaw dropping. A big thank you to NetGalley, Penguin Group Dutton and Bryan Reardon for providing an ARC in exchange for an honest review! THE REAL MICHAEL SWANN by BRYAN REARDON was an extremely gripping, intense, and suspenseful story that had me totally engaged and interested right from the very first chapter. I was totally intrigued and emotionally invested in this story and thought the premise was unsettling but also so terrifyingly realistic. The scenes were intense and dramatic that had my heart-pounding and on the edge of my seat in anticipation of what was going to happen next. I was totally entertained and flew 4.5 Stars! Thank you so much to Edelweiss, Dutton, and Bryan Reardon for the opportunity of reading an advanced copy of this book in exchange for a review! The Real Michael Swann is part family drama with a little love story there between our two main characters Michael Swann and his wife Julia along with an intriguing story of a disaster. We all agreed the plot to this story was interesting, and clever. There is a bit of drama here and some backstory into our characters lives that felt a bit like a love story. That's where we started to split with how we felt about the story. For some of the drama drove the story forward and added tension to the story and for the rest of us it slowed the story down for us. We recommend to readers who like some drama to their thrillers. Thank you so much to Edelweiss, Dutton, and Bryan Reardon for the opportunity to read and review an advanced copy of this book in exchange for a review! Michael and Julia Swann had gone through some big changes in their lives but were both loving parents that would do anything for their boys. As Julia waits for Michael to come home from the city one evening after a job interview she gets a call from him that the station had been closed and he wasn't sure how or when he'd get home. The next Julia knows she hears that a bomb had exploded in the city just after the call had dropped with her husband. Julia is frantic with worry after hearing the bre Michael and Julia Swann had gone through some big changes in their lives but were both loving parents that would do anything for their boys. As Julia waits for Michael to come home from the city one evening after a job interview she gets a call from him that the station had been closed and he wasn't sure how or when he'd get home. The next Julia knows she hears that a bomb had exploded in the city just after the call had dropped with her husband. Julia is frantic with worry after hearing the breaking news but with two young children depending on her she is determined to find out what happened to Michael. Call after call goes unanswered as all of the phone services to the city are down and with each passing moment Julia begins to worry more. As Julia begins her search she gets the worse news possible, police may suspect that the one behind the bomb was her loving husband Michael. The Real Michael Swann by Bryan Reardon is an extremely tense thrill ride that is sure to keep readers on the edge of their seat. Written at a time in our society when you hear of big heartbreaking events happening on the news all too often this story is extremely compelling as it's about the wife left behind of an accused bomber that has taken the lives of many. Julia was a character that I immediately loved. A young mother who would rather read a book than watch baseball but will do anything for her boys even if it's sitting through the sport to make them happy. When the news breaks of the bombing I couldn't help but hurt a bit inside for her when it's not known whether the love of her life was alive or not. As the story goes on it was so hard to even think of putting this book down until knowing what the outcome would be. One that covers all of the emotions as things unfold and a definite page turner until the very end. This is certainly a story that I'd recommend to the thriller fans looking for a realistic engaging read. Although this is a fast moving story, and did a good job describing the terror a wife feels when after a terrorist attack, her husband is missing, this book missed the mark for me . To much running here and there, implausible circumstances and unbelievable scenarios kept me from fully commiting to the story. It does have an interesting twist, but it was one I guessed relatively early. This was a sisters read, and for this one we fell into three different coulees, with most liking it much more. My Although this is a fast moving story, and did a good job describing the terror a wife feels when after a terrorist attack, her husband is missing, this book missed the mark for me . To much running here and there, implausible circumstances and unbelievable scenarios kept me from fully commiting to the story. It does have an interesting twist, but it was one I guessed relatively early. This was a sisters read, and for this one we fell into three different coulees, with most liking it much more. Myself with four of my fellow readers ended up in the weedy coulee, where I was assured there were no snakes nor bugs present. Good company there. My point being others found it more to their liking, so always wise to read it for yourself. Michael Swann is in Penn Station, on the phone with his wife Julia when the unthinkable happens. An explosion. A terrorist attack. Just like that the line goes dead and Michael appears to be missing. Unable to accept the “alternative” - Julia Swann searches for her husband. She is completely desperate and she will stop at nothing until she finds her husband. What starts out as harrowing, scary and mysterious, becomes strange and implausible all at once. “The Real Michael Swann” has an interesting premise - one that felt quite to real to me, give the fact that I live so close to NYC. Unfortunately, the delivery fell a little short. The character of Julia however, immediately pulls you in - her anxiety, her sorrow and even her plight. While her actions were hard to understand at times, especially given the fact that she was a mother of two young children, the author does a great job showing Julia’s despair and her need for answers. Until the surprise ending, I was really enjoying this novel, and then, unfortunately the storyline kind of fell apart for me, though I know it worked for other reviewers. This is a domestic suspense and was a fast paced easy read. This was a buddy read with Kaceey! So glad we read it together! Thank you to Edelweiss, Penguin Publishing Group and Bryan Reardon for an ARC of this novel in exchange for an honest review. I'm just going do write a little mini-review of this one. I thought the premise of a terrorist attack and the mystery of what happened to Julia's husband, Micheal was an interesting one. She was speaking to him on the phone (he is at Penn Station waiting for his train to get home) and the line goes dead when an explosion is heard. This sets up a terrifying situation and one that seemed realistic. Julia proceeds to search for Micheal and tries to track him down. The flow didn't work out for me. The pace felt extremely slow (I struggled) and some of the events weren't plausible (to me). I know others have enjoyed this one, so I would check out other reviews before you decide if this will be a winner in your eyes. Thanks to EW for my ARC. Well there is a twist! Or is it a decoy??? Is your husband a homegrown terrorist? Has life in Corporate America become so overwhelming that he has become so revolted with the world and bitter that he can blow up a train station with thousands of commuters traveling through? This is what Julia has to ask herself! The question is, who is the real Michael Swann? Is it her husband or is he the innocent victim? Plot twist at the end!!! But now I am getting way ahead of all of it…If you have read the syno Well there is a twist! Or is it a decoy??? But now I am getting way ahead of all of it…If you have read the synopsis of the book, then I have to say that I cannot give anything more away as to what this book is about. I usually always write my own interpretation of the novel and then my thoughts about it. On this rare occasion I cannot do that or I know I’ll give something away. It follows the blurb perfectly with a twist! Julia is a good mother to their sons, a good wife to Michael and a good daughter, neighbor, friend and community member. Their relationship started off like so many. After college they had dreams and aspirations and they consistently improved their life. Then came the day they wanted to have children and settle down, so they moved to the burbs and money got tighter. With all the activities the kids were in, life got busy, they became older, their relationship changed. But there was always love. When the intimacy is waning, and Michael’s job is in jeopardy because of the competition their marriage hits a rough spot. Sounds normal/, right? We think that Michael loves Julia. He may not know, unless he is not who we think he is! The plot is laid out with two lines to hold on to as the reader. One is about what is happening with the terrorist attack, Michael, the news, the family and friends. The other one is interspersed with flashbacks and memories that give the reader an idea about the couple itself and their relationship. Hence what I wrote above. The message: Even when times get hard, you have to keep the good times in mind. You may not have the chance to let loved ones know what they mean to you when they are gone. And if there is a chance that this person could be alive after a terrorist attack, you will do anything to find your loved one, as Julia did in the novel. The plot building was great. A perfect blend of feel and suspense. Explored are media manipulations, corporate schemes and emergency responder / police tactics. This novel could be real. What happens here could be a slice of America, happening to the average family. Tragic, but it had me thinking of what would I do? 9/11 comes to mind, when the phone lines were dead and you just did not know if your family member was safe for the longest time. I have to agree with all the other gushing reviews. I loved this book and I am still wondering about that quick twist at the end. I almost want to say…let’s write a sequel! That would be alright, right? This was a Traveling Sister group read and we were split fairly evenly. Some enjoyed it, but it didn't work for the rest of us. The story had a strong start with an interesting premise, and the author did a good job capturing the initial panic and confusion that would naturally occur after a terrorist attack. There were passages that made me pause, and an excellent point was made about how the media's 24-hour news cycle has changed the way news is reported, with too much opinion, not enough fac This was a Traveling Sister group read and we were split fairly evenly. Some enjoyed it, but it didn't work for the rest of us. The story had a strong start with an interesting premise, and the author did a good job capturing the initial panic and confusion that would naturally occur after a terrorist attack. There were passages that made me pause, and an excellent point was made about how the media's 24-hour news cycle has changed the way news is reported, with too much opinion, not enough facts. The book ended on an excellent note with thoughts to ponder. But none of these things saved the book for me. Unfortunately, I found the plot execution and the character's actions somewhat ludicrous, with melodramatic, overwrought story-telling. It's just not a style I enjoy which made it difficult for me to suspend disbelief. I found myself skimming a lot yet not missing much. I guessed the outcome, but that alone is never enough to ruin the story for me. Other readers have enjoyed this book and have written many excellent reviews. Julia Swann is at her suburban Pennsylvania home talking on the phone with her husband, Michael, when the phone goes dead. A bomb goes off at Penn Station where Michael has been waiting to catch a train ride home. Seeing horrific images of the chaos on the news and unable to get a hold of Michael, Julia is desperate to find him. But just when she thinks her prayers are answered and Michael is alive, she starts to question if she really knew her husband at all. So the story certainly grips you alm Julia Swann is at her suburban Pennsylvania home talking on the phone with her husband, Michael, when the phone goes dead. A bomb goes off at Penn Station where Michael has been waiting to catch a train ride home. Seeing horrific images of the chaos on the news and unable to get a hold of Michael, Julia is desperate to find him. But just when she thinks her prayers are answered and Michael is alive, she starts to question if she really knew her husband at all. So the story certainly grips you almost right away and doesn't let go until the end. I liked how the author did the back and forth perspectives of the characters as it made for a more tense, but in a good way, read. I think the book really plays into the whole notion of can you ever truly know someone? While the big climatic scenes were a bit disappointing, I did like how the story was wrapped up in the epilogue. Even though the book has some flaws, it is still a fun ride and I recommend to fans of the suspense genre. Thank you to Dutton books for sending me an ARC of this book! Wow! This was my first book by Bryan Reardon and I'm happy to say I will be a fan for life. This book was really fantastic and touched on a few different topics during it's story. The book starts out with someone (and we don't know who) in therapy and they are watching a video of themselves in Penn Station. It's a grainy video but all of a sudden it starts to shake and it goes dark. There's been a bomb/terrorist attack in Penn 4.5 Stars! The book starts out with someone (and we don't know who) in therapy and they are watching a video of themselves in Penn Station. It's a grainy video but all of a sudden it starts to shake and it goes dark. There's been a bomb/terrorist attack in Penn Station and they think they know who's done it..
Julia and Michael Swann met one night at a bar. They started to date, eventually got married and were super career focused. One of Julia's friends showed her a suburban area that was very nice in Pennsylvania (far from Delaware where they currently are) that families with kids tend to move to. They Swann's decide to move there however this causes Julia to give up her government career and Michael goes into Medical Sales instead of living out his dream of working in baseball. Like any marriage they have their ups and downs but when Michael finds out he may be losing his job things get sour real fast. There's been a bomb/terrorist attack at Penn Station and Michael was there. Julia is consistently trying to get in contact with her husband but hasn't heard back. She is determined to find him no matter what it takes. One of her friends turns on the TV and Julia see's a devastating headline (no spoliers here..you'll have to read to find out!) Julia continues on a mission to find Michael convinced he is alive. This book is about terrorism in the US, family dynamics and how far you will go for love. With the current political climate, I though the different conversations in regards to politics was interesting. The author put in racist comments but characters, a fight scene that was because of a racial insensitive person and conversations between liberals and conservatives. Of course any attack anywhere is terrible but this book was thought provoking in the sense that I thought about how far I'd go to find/save my spouse when a national tragedy occurs. Julia had to balance both finding Michael and keeping her mom and sons safe at home. Provocative, powerful and simply electric, “The Real Michael Swann” captured my attention from the very first page! A five-star read, from author Bryan Reardon. Julia Swann is on the phone with her husband, Michael, when the call disconnects. There has been an explosion at Penn Station, where Michael was, and the entire city is in a state of chaos and disarray. Julia is convinced her husband is alive and, determined to find him, she heads out into the city to search for him. Calls to him contin Provocative, powerful and simply electric, “The Real Michael Swann” captured my attention from the very first page! A five-star read, from author Bryan Reardon. Julia Swann is on the phone with her husband, Michael, when the call disconnects. There has been an explosion at Penn Station, where Michael was, and the entire city is in a state of chaos and disarray. Julia is convinced her husband is alive and, determined to find him, she heads out into the city to search for him. Calls to him continue to go unanswered, although she does get periodic calls from strangers stating they have seen a man who resembles her husband. As her quest for him continues, the search into the bomber continues and Julia is pulled into a dangerous game of hide and seek. “The Real Michael Swann” is a thought-provoking tale of true love and the honesty and unfailing aspect of relationships. It depicts humanity at its best, and worst moments, in times of chaos and strife. Julia and Michael appear to have the perfect marriage, but as it is slowly dissected and their secrets are uncovered, it becomes clear that the couple are as dysfunctional as the rest of us, making both characters immediately likable and relatable. Their relationship and Julia’s unfaltering trust in her husband are both endearing and heartwarming. “The Real Michael Swann” is told in short chapters, from the alternating views of Julia and “Michael”. The reader is teased from the beginning with various “almost” moments, where Michael and Julia are close to reuniting, and then the moment passes. Throughout the whole novel, I was on the edge of my seat. The unsuspecting twist, followed by the satisfying ending, makes this novel a haunting, smart, and creative piece of fiction. It is modern and well-matched with today’s society, and yet somehow manages to be politically charged without choosing sides. I will seek out Reardon’s other work, “Finding Jake”, and I will do so immediately. I cannot wait to read another gripping tale from Reardon. Well done! I won a copy of this book sometime in late March. Seeing as it never arrived (which for the record I don't think was the publisher's fault, just saying; it was probably the shipping company), I bought my own copy upon its release. I'm glad I did, because The Real Michael Swann is an impressive, complex mystery with a lot of originality making it stand out. Set in the US, the story not only questions the digital age and our desperate reliance on cell phones for all aspects of daily life and commu I won a copy of this book sometime in late March. Seeing as it never arrived (which for the record I don't think was the publisher's fault, just saying; it was probably the shipping company), I bought my own copy upon its release. I'm glad I did, because The Real Michael Swann is an impressive, complex mystery with a lot of originality making it stand out. Set in the US, the story not only questions the digital age and our desperate reliance on cell phones for all aspects of daily life and communication, but it's also a compelling, emotional story of terrorist attacks and begs the question, "how much do you really know about your loved ones?" For Julia, her search for her beloved missing husband turns into a mystery as she frantically tries to find out if he's still alive in a way very similar to what we see in news stories about similar attacks in the past twenty years. An explosion happens in Penn Station and many are killed in what might be considered a terrorist attack. As the police, EMTs, firemen, and others rush to help those who have been injured a frantic wife tries to reach her husband. All cell service has stopped and as the panic of what has occurred comes to all, the wife, Julia, decides to take matters into her own hands and find her husband. She is convinced he is alive and her determination to find Michael makes up the gist of this story. I think this book reverberated with me, because of the events that happened on 9/11. My husband was working on Sixth Avenue in Manhattan at that time and I, too, lost any kind of communication with him. It was a terror that was unimaginable and I was so in tune with what Julia Swann was going through. The sheer panic one feels in this situation is unbelievable. You don't know what to do, you are helpless and hope is the only thing that keeps you going. Mr Reardon has certainly painted a realistic picture of what a terror attack does to people. One has the sense of the unreal, the panic and the grief that follows when this senseless occurrence happens and we feel that we have been cast adrift in a world we don't understand anymore. This was an intense book which sends the reader on this journey that Julia takes to find the man she loves, the man she shares her life with, and the father of her children. There are lots of twists and turns in this book and we find ourselves so attuned with Julia as she searches for Michael. Will she find him or will she be left with just the memories of the man she loves? Thank you to Bryan Reardon, Dutton Publishing, and Edelweiss for a copy of this book. A mysterious man sets a forest aflame next to a railroad, diverting oncoming trains back to a train station. Not much later, a man wanders into the same train station with a briefcase full of explosives. A few minutes later, the train station is blown to pieces, leaving thousands of people dead and injured. What happened that fateful day? Who is responsible for the killings? 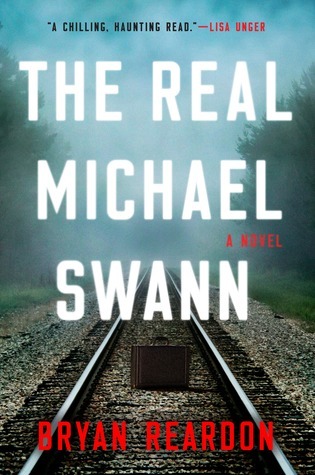 Bryan Reardon's The Real Michael Swann centers on this mystery, focusing on how it ripples through the lives of the Swann family. Michael Swann is at the train station, Penn Station to be more specific, when the blast goes off. Julia Swann, Michael's wife, is on the phone with him when the explosion happens. Michael's phone goes dead, leading Julia on a wild chase to find her husband and discover the truth about what happened that terrible day. Is Michael somehow involved in the terrorist plot? Who is behind the plot, and how is the Swann family involved? This book pulses with heart and tension. The heartbreak and terror Julia experiences as not only Michael's wife but the mother to their two boys bleeds through the pages. I found the ending very satisfying but bittersweet. I read the book in less than 24 hours because I could not put it down! Thank you to the author, Bryan Reardon, the publisher, Dutton, and Edelweiss+ for the opportunity to read an advanced reader copy of The Real Michael Swann. The book will be available for purchase on June 12, 2018. The premise for this one strikes a cord because it reads like something that could actually happen, similar things have happened, and nothing is more frightening than fiction becoming reality, especially in terms of terrorist attacks. This is part thriller part domestic suspense with moments of poignancy as Julia and Michael’s marriage is examined under a sharp lens and part heart pounding action thriller as the race to find Michael intensifies. This did take me a little while to get into it’s no The premise for this one strikes a cord because it reads like something that could actually happen, similar things have happened, and nothing is more frightening than fiction becoming reality, especially in terms of terrorist attacks. This is part thriller part domestic suspense with moments of poignancy as Julia and Michael’s marriage is examined under a sharp lens and part heart pounding action thriller as the race to find Michael intensifies. This did take me a little while to get into it’s not one of those books that grabbed my attention instantly but it did reel me in about a quarter of the way through and then I finished it in few sittings. The explosive ending more than made up for it though, I really liked how things worked out and absolutely loved the epilogue. I really connected with Julia, her pain and confusion was palpable and her feelings as a wife and mom were very relatable for me. Many of the chapters were short which is always a technique I enjoy and Reardon is a solid writer with a penchant for weaving a compelling tale. The Real Michael Swann in three words: Timely, Suspenseful and Gripping. Michael and Julia Swann are talking on the phone, while he is waiting for a train home from Penn Station, when a bomb explodes. The rest of the book is told in alternating chapters by the injured Michael, who feels the need to run away for reasons he does not understand, and Julia who is desperate to find her husband. There are flashbacks to how the couple originally got together and there is some discussion about white middle class dissatisfaction in the age of Trump but really nothing happens Michael and Julia Swann are talking on the phone, while he is waiting for a train home from Penn Station, when a bomb explodes. The rest of the book is told in alternating chapters by the injured Michael, who feels the need to run away for reasons he does not understand, and Julia who is desperate to find her husband. There are flashbacks to how the couple originally got together and there is some discussion about white middle class dissatisfaction in the age of Trump but really nothing happens in this book except a lot of driving and text messaging. I guessed the big twist in the book early on and kept reading only to confirm that I was correct. This author needs to learn that making the chapters of his book one page long does not increase the tension or momentum in a book that has none, and it's a tired device. That was the trick the author tried at the end of this book and it did nothing to salvage a story that was flat and repetitive. The epilogue added nothing to the story. I am starting this review the same way that I did The Boy at the Door – I realize not every book is for every person. I found The Real Michael Swann to be overly predictable and from the almost the beginning I was able to figure out what the “surprise ending” was. The characters, especially Julia Swann, were all over the place; one minute seemingly hating her husband and their life, the next the complete opposite. I kept getting whiplash. I would have preferred a more subtle approach (and a new I am starting this review the same way that I did The Boy at the Door – I realize not every book is for every person. I found The Real Michael Swann to be overly predictable and from the almost the beginning I was able to figure out what the “surprise ending” was. The characters, especially Julia Swann, were all over the place; one minute seemingly hating her husband and their life, the next the complete opposite. I kept getting whiplash. I would have preferred a more subtle approach (and a new title). Michael Swann, who is in New York City, is talking to his wife Julia on his cell phone. The phone call goes dead and Julia learns that a bomb has gone off. Julia rushes out to the car and tries desperately to get into the city to find Michael but is stopped by police barricades. She keeps trying to text and call Robert but there’s no response. Then developments are revealed by the news media that prove devastating to Julia. I thought this was a particularly interesting premise. As always, I don’t Michael Swann, who is in New York City, is talking to his wife Julia on his cell phone. The phone call goes dead and Julia learns that a bomb has gone off. Julia rushes out to the car and tries desperately to get into the city to find Michael but is stopped by police barricades. She keeps trying to text and call Robert but there’s no response. Then developments are revealed by the news media that prove devastating to Julia. I thought this was a particularly interesting premise. As always, I don’t like to give away too much of the plot and leave it to the author to tell his story so I can’t explain why the premise is an unusual one since the publisher isn’t mentioning it in their blurb about the book. Leave it to say there is more involved than a wife trying to find her husband during a possible terrorist attack. While I did figure out quite early what was happening, it didn’t take away from my enjoyment of the book at all. At the heart of the book is the love story of Michael and Julia. As Julia tries to find Michael or at least get some news about him, she relives their life together. It’s a beautifully and realistically told story. There’s a point more than half way into the book where it becomes very suspenseful. I wouldn’t consider this one a thriller overall but more of a character study. I liked the author’s book, “Finding Jake”, and his newest effort didn’t disappoint. The story pulled me in and I became invested in the characters’ plight. The Real Michael Swann is a plot driven book that is part love story and part thriller with some politics thrown in. I like a plot driven book with a twist and his book had that. At times the plot was captivating, yet at other times it was the opposite. The author did write realistic and well thought out characters. It's scary considering this could be a true story. When I first had the opportunity to read this book, I hesitated. I had already read two books where the characters feigned death from a tragedy to escape a life they felt trapped by, and no longer wanted to be living. I was afraid that this might be the third. Julia and Michael are on the phone with each other when the call goes dead. A bomb has just been detonated at Penn Station where Micheal was waiting for his train home. Julia has no idea if Micheal has survived. This FAST paced n When I first had the opportunity to read this book, I hesitated. This FAST paced novel of suspense then alternates between chapters to fill you in on Micheal and Julia’s love story, and the present. As Julia’s calls and texts go unanswered, you can feel her desperation and her determination to find him. I cannot say more without spoilers, so, I won’t. But, I will say the short chapters will get your adrenaline going and it’s an easy book to devour in one sitting. I am glad that I decided to read it. When a terrorist strikes a NYC subway, a terrifying string of events occur to the Swann family. I really loved this novel and would give it 4.5 stars. I highly recommend the reading of THE REAL MICHAEL SWANN to all! Thank you so much to Dutton Books for my free copy of THE REAL MICHAEL SWANN by Bryan Reardon - all opinions are my own. While waiting for train, Michael Swann is talking to his wife Julia on the phone at Penn Station, when a massive explosion goes off and severs the call. Julia, in a state of panic, jumps in her car to drive from their home in Pennsylvania to New York. But there is traffic and mayhem from the explosion, she can’t find her husband, and then she hears the news...Um, let’s just say Thank you so much to Dutton Books for my free copy of THE REAL MICHAEL SWANN by Bryan Reardon - all opinions are my own. While waiting for train, Michael Swann is talking to his wife Julia on the phone at Penn Station, when a massive explosion goes off and severs the call. Julia, in a state of panic, jumps in her car to drive from their home in Pennsylvania to New York. But there is traffic and mayhem from the explosion, she can’t find her husband, and then she hears the news...Um, let’s just say at this point I WAS HOOKED. This novel is edge-of-your-seat fantastic! It’s intense and Reardon does a tremendous job capturing the fear of an attack of this magnitude. It’s a page-turner indeed and all too realistic. And while this is a thriller, it’s also a mix of domestic suspense because we examine Michael and Julia Swann in the process of what’s going on. The construction of the novel and writing style is phenomenal and really keeps you engrossed in the story. Reardon writes Michael’s point of view in the first person as he suffers through amnesia and we follow Julia in the third person where we see how she deals with the aftermath of it all. THE REAL MICHAEL SWANN is full of plot twists, gets better and better with each page, and make sure you read that epilogue! WOW! This story has a very strong narrative drive, with a fluid writing style, and a few unexpected twists. The book is cleverly plotted, thoughtful and unsettling...and that, my fellow readers, is a very good thing. I loved it! Talk about a fast paced book! I read this in a matter of hours bc I literally couldn’t put it down! I was really impressed with BR writing in Finding Jake & this one was just as phenomenal! The Real Michael Swann is a study of a married couple separated by a terrorist bombing at Penn Station which leaves Michael wandering around with amnesia and Julia home with the kids desperately trying to figure out what happened to Michael. It is a study of their emotions and their frustration. Don't think of this as a thriller. It isn't. It is rather slow moving and kind of like viewing the world through a fishbowl. The Real Michael Swann pulls you right in from the beginning! Michael Swann is just a regular guy trying to return home from a job interview when his whole world literally comes crashing down. This is a story of a family ripped apart by horrific violence and a wife trying to seek the truth. The author, Bryan Reardon, takes you on an emotional, suspenseful ride till the very last page. The Real Michael Swann is a compelling and chilling read! I definitely recommend! **4-riveting stars** ⭐⭐⭐⭐ The Real Michael Swann pulls you right in from the beginning! Michael Swann is just a regular guy trying to return home from a job interview when his whole world literally comes crashing down. This is a story of a family ripped apart by horrific violence and a wife trying to seek the truth. The author, Bryan Reardon, takes you on an emotional, suspenseful ride till the very last page. The Real Michael Swann is a compelling and chilling read! I definitely recommend! The thrillers I've read recently have left me feeling incredibly underwhelmed. Given the intriguing synopsis of THE REAL MICHAEL SWANN, however, I had high hopes that this would be the game-changer, something that would finally dazzle me. Unfortunately, that wasn't the case, as THE REAL MICHAEL SWANN wasn't the book for me. I didn't find it particularly exciting. I was able to see the big twist coming from miles away, and it also didn't help that I couldn't get into the writing style. It was ver The thrillers I've read recently have left me feeling incredibly underwhelmed. Given the intriguing synopsis of THE REAL MICHAEL SWANN, however, I had high hopes that this would be the game-changer, something that would finally dazzle me. Unfortunately, that wasn't the case, as THE REAL MICHAEL SWANN wasn't the book for me. I didn't find it particularly exciting. I was able to see the big twist coming from miles away, and it also didn't help that I couldn't get into the writing style. It was very cut-and-dry, leaving me feel like I barely knew the characters even after over 300 pages. THE REAL MICHAEL SWANN alternates between two perspectives: Julia Swann and a man assumed to be Michael Swann. Neither perspective truly jumped out at me, and I found the mixing of first and third person to be awkward. I didn't find Julia to be all that likable or interesting, and I disliked how she was always leaving her children behind to follow a clue that may or may not pan out. I think Julia was supposed to come off as this strong, brave woman who'd risk everything for the man she loved; however, I never felt that way about her. The bond between her and her husband wasn't very strong, and I couldn't feel the chemistry between them, even with the numerous flashbacks to their monumental as a couple. Honestly, it seemed as if they settled by marrying each other, and what I disliked the most was how Julia put her career goals aside to appease Michael. It just didn't seem like a healthy relationship, and because of that, how could I truly root for Julia to find her husband, to stand behind him even when the press began to attack him? Michael Swann's perspective was also hard to get through. There was little development, and while I knew his perspective was supposed to be mysterious and twisty, I also didn't get that feeling. More times than one I skimmed his parts. THE REAL MICHAEL SWANN primarily focuses on the aftermath of a terrorist attack in NYC as well as what the attack means for the Swann's marriage. I found the opening of this book to be the best part. I liked how "perfect" everything seemed at first, like any other ordinary day. It created a sense of eeriness, one that only increased as a brief chapter was included from the terrorist's perspective. It made me excited to see what would come next. As the book progressed, though, the book became less and less interesting. I didn't find Julia's wild goose chase to be all that exciting, especially when the majority of it involved her just driving back and forth to the tunnels, only to be turned away. There was also an anticlimactic feel to the big hunt that developed near the end. The book felt so stretched out at that point that I just wanted a conclusion already. I will say, however, that I did like the different news commentary included. It was interesting to see Bryan include what the different news outlets were saying about the attacks, as it rung true to what's said in the news everyday. Overall, THE REAL MICHAEL SWANN wasn't my sped for a variety of reasons. I wish I had liked it more. It does contain an intriguing premise, one that I think would make for an interesting movie; however, the characters and the plot execution brought the book down considerably in my opinion. Side note: The last scene....I understood what Bryan was going for with it; however, it annoyed me more than it intrigued me.